Comment: I knew there was a reason I'm living in Minnesota besides the great winters...no appreciable chance of an earthquake! All kidding aside, even those states without significant direct threat from an earthquake should be planning for one. That's because in this day and age of interconnected infrastructure a significant event in one part of the country is going to have serious indirect impact on other parts. And, there will be a need for significant response and recovery assets from outside the quake zone. 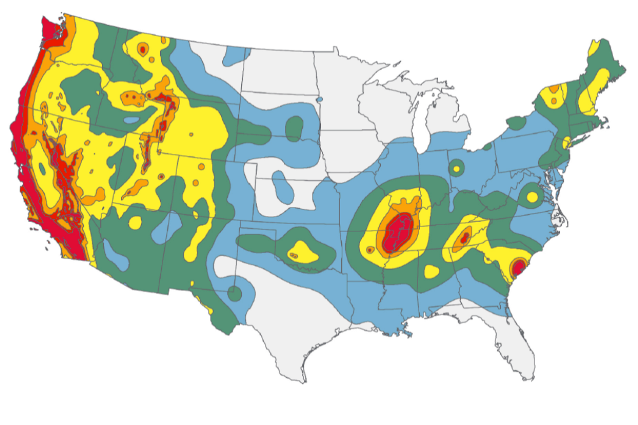 Of great concern in that regard is the New Madrid Seismic Zone through which a substantial amount of the nation's liquid energy (in pipelines) and a majority of nation's inland waterway commerce passes. Unfortunately, to date, much of the response planning for that area has only involved states which would be directly impacted.